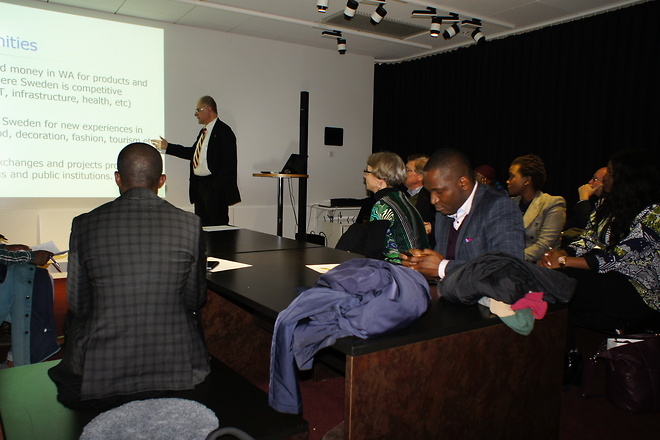 SWACC had a kick-off meeting of the Commercial Group of SWACC on the 27th of January 17h-19h at Chamber Trade Sweden, United Spaces Business Center Klarabergsviadukten 63, Stockholm. This is the start of something that we believe can contribute a lot to the development of all kind of economical exchanges between West Africa and Sweden. We will focus on business that can develop things in Africa. There are numerous needs and opportunities where Swedish companies can offer competitive solutions. There are many things in West Africa that can meet market demand in Sweden. There are areas where a cooperation between actors in West Africa and actors in Sweden can create new business. We believe the African diaspora in Sweden has a key role in this. We intend to work both on concrete business opportunities as well as strategic issues and key success factors. Everybody active in or intending doing business in West Africa, in Sweden with an African touch or between West Africa and Sweden can benefit from working within the chamber meet new potential partners, to solve common issues, find new ideas of developing their business or creating new business. To participle in the further work after the kick-off, you need to be a member of SWACC. The application form including membership fees and payment information is attached. It will be possible to apply and pay at the kick off.